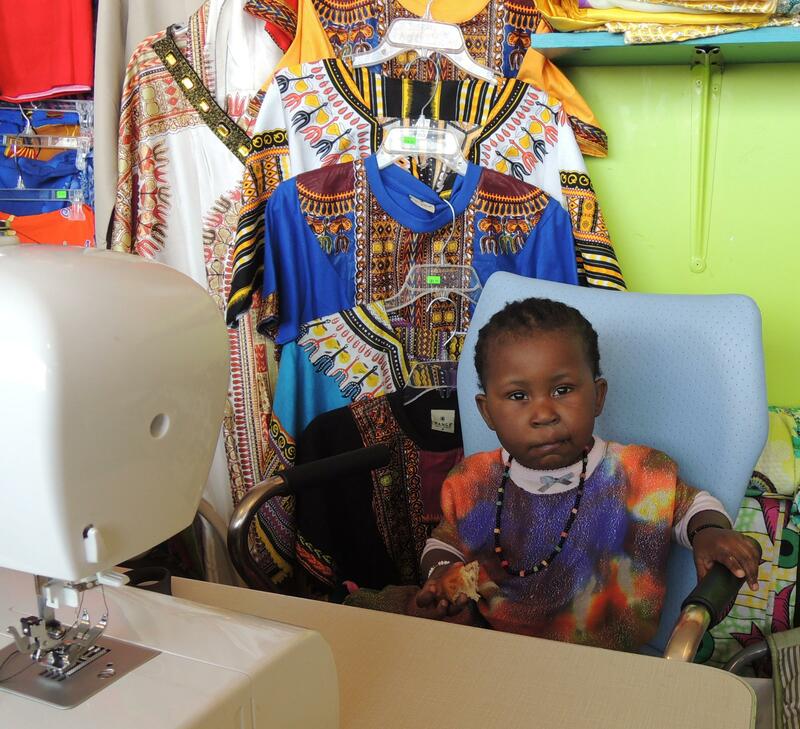 You're likely to meet the entire Mberwa family on a visit to Loba African Fashions and Produce. The Boise International Market is throwing its grand opening celebration Saturday from 11:00 a.m. to 7:00 p.m. with live music and dance from around the world. Sixteen individual businesses are now open at the market, and six more are coming soon. The indoor market at Franklin and Curtis in Boise is modeled after open-air bazaars found all over the world. Many of its stalls and small shops are owned by refugees and immigrants who have taken out micro-loans to start their own businesses. On the eve of the grand opening, we want to introduce you to a few of them. 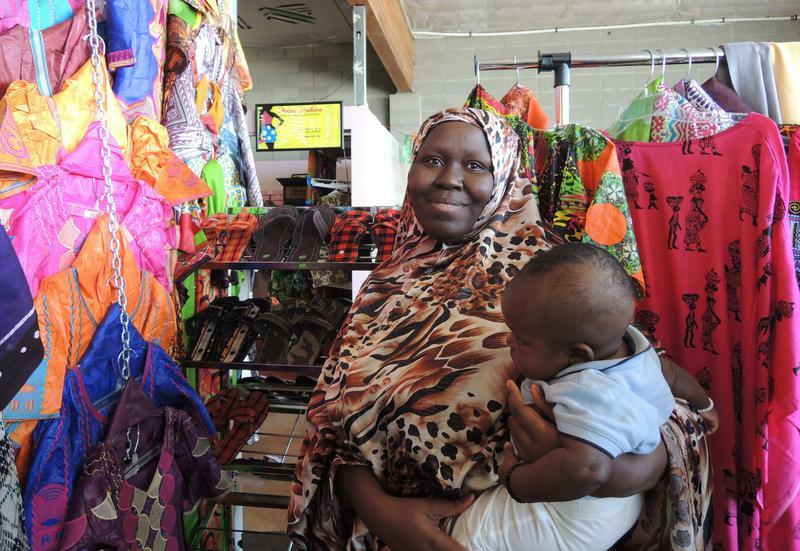 One of the first people you’re likely to see when you enter the Boise International Market is Kutukira Mberwa. “I try, like everybody who come in here, at least say hi to them, give them a smile,” Mberwa says. Mberwa’s stall is right in front of one of the main entrances. She sells African clothes, sandals, jewelry and vegetables her husband grows. 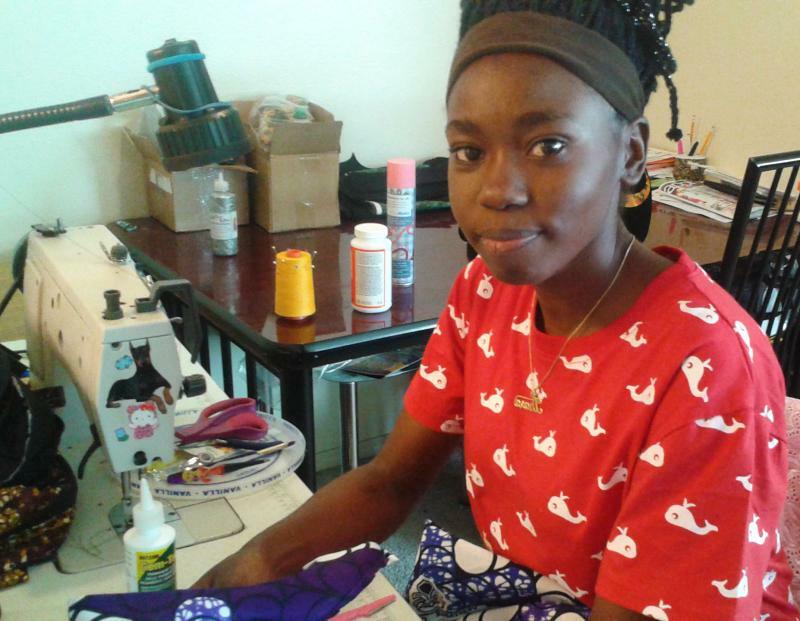 Mberwa says her sister in Tanzania makes the dresses on display and she does alterations. Mberwa's daughter takes a snack break from her unofficial greeter job. If Mberwa doesn’t greet you, her precocious, not-quite two-year-old daughter will. The building owner calls the girl the market ambassador. “And she’s constantly sneaking out and running off and I have to go get her,” she says. Mberwa says she and all three of her kids are here every day. Her three-year-old boy is asleep under the sewing table and she has a baby balanced on one knee. Mberwa says she spent part of her childhood in a refugee camp in Kenya after her family was displaced by the Somali civil war. She says she was resettled in Arizona 10 years ago, then came to Boise to marry her childhood sweetheart. This type of market may be new to Boise, but it’s familiar to Mberwa. In Africa she says, her father made traditional handicrafts like fans, baskets and brooms. She’s not the only business owner here with entrepreneurial experience. Kibrom Milash and his wife Tirhas own the Ethiopian and Eritrean restaurant. It’s the third restaurant they’ve owned. They lost the first to war. 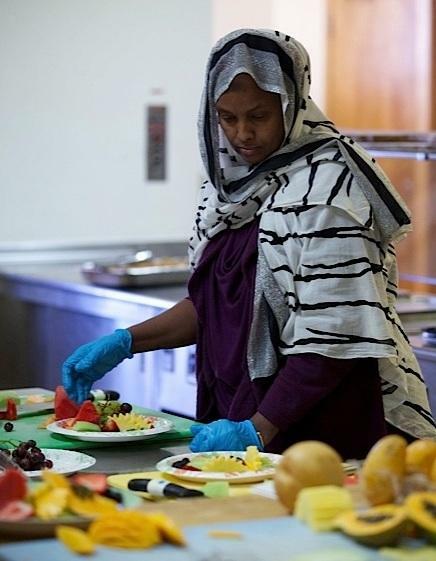 Then they opened a new one in the refugee camp where they lived before being placed in Boise. The Milashes make injera everyday. The spongy bread disks are the staple of Ethiopian and Eritrean food. Milash says at first, in the camp, all people had to eat was a monthly ration of wheat, salt and oil. But then relatives in stable countries began sending in money and an entire economy grew among the makeshift clay houses. His stainless-steel kitchen in the Boise International Market is a big change. Others at the market are first time business owners. Salam Bunyan owns an Arabic restaurant. The Iraqi refugee says he’s been a chef for 15 years and has always dreamed of having his own restaurant. When he came to Boise, he says he thought his dream would come true. But after eight years he had begun to lose hope. Salam Bunyan is a blur as he zips around his kitchen. But Omid Mousa has other dreams. The coffee stand he helps run is more his brother’s dream. The Afghani brothers sell regional coffees like Turkish, Egyptian and Cuban, as well as teas from around the world and homemade baked goods. Omid says he enjoys running the business with his brother but it means he can only take one college class a semester. Omid Mousa was born in Afghanistan, lived in Pakistan and Moscow Russia before coming to Boise as a refugee. He says business has been going well since they opened last fall. All the restaurants are doing well. Salam Bunyan says he put too many items on his menu but when he tried to whittle it down his customers wouldn’t allow it. Market co-owner Lori Porreca says the market as a whole has been on a continual upswing since businesses started opening. But not everyone is doing equally well. Prem Subba's shop, like many in the market is a family affair. He and his wife run it together and their son "helps" out. Prem Subba’s little grocery store is having trouble. Subba is a member of Bhutan’s persecuted Nepali minority. He’ll sell you everything you need to make an authentic Himalayan meal. He says start with a bag of red rice. Then you’ll need some hot peppers. Subba says Bhutanese like their food very spicy. Then he recommends a bag of traditional dried radish. But he only has one in stock right now. Subba says it’s not demand but supply that’s hurting his business. He says he’s struggling to find reliable suppliers who import Nepali and Bhutanese products and are willing to sell to Boise. “But I believe that one day when we have good channels and good suppliers, we definitely make good place,” Subba says. Back at the front of the market Kutukira Mberwa says she has good days and not-so-good ones. But she says after life in a refugee camp and then years doing landscaping work with her husband in Boise, she has no complaints. “To be in here with the AC running… I am more than happy,” she says laughing. Correction: We originally misspelled the South American country Colombia. Rita Thara Yenga shows off two plastic boxes full of women's bags she's sewn. She's preparing inventory for her new store "Thara Fashion." It opened in October at the International Market in Boise. "I'm so happy to show people my talent," she explains. "It makes me excited." Rita sells clothes and accessories for American sensibilities, but with a distinctly African twist.